Ground Survival Instructor Course. Arrestling techniques have been developed over the past 15 years for Law Enforcement by Law Enforcement Professionals. 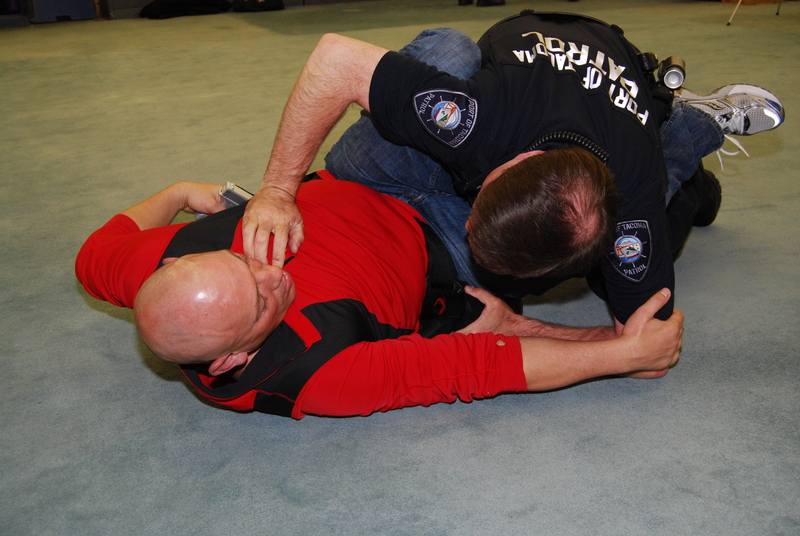 This course stresses police ground tactics that avoid exposing your duty weapon and NOT for sport submission training. Course incorporates duty weapon into many training drills. Course exceeds State and Federal Standards for Police Ground Survival Instructor. Combat back-front-side falls with gun, shooting from the ground, ground control holds figure-4, kimura, armbar from top-seated-side, ground survival tactics, defense against takedowns, striking from top and botton positions, escape from chokes, escape from mount and guard, getting back to standing safely, closing the gap to takedown, foot sweep takedowns, WRAPS™ takedown front-rear, ground weapon retention, getting suspects hands out from prone, small joint locks, defense against eye gouges, re-centering legs from ground, sweeps from ground to gain top control, arm locks to controlled cuffing, combat cuffing and two officer tactics. Certificate: Certificate will be good for 2 Years after completion of class.